Simple math suggested that there'd be one 8-0 team at Grand Prix Madrid this year, but things didn't turn out simple. 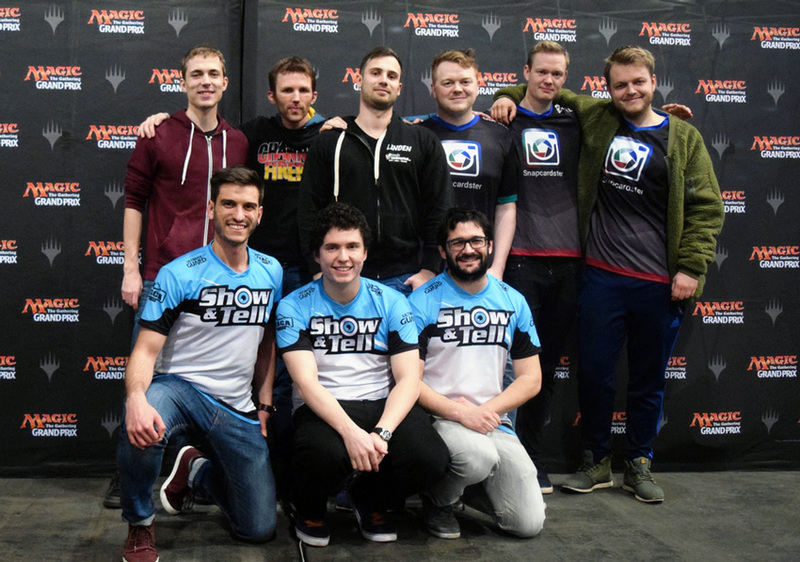 Instead, after a series of unintentional draws, we got no 8-0 team but three teams who finished the first day with a record of 7-0-1 (pictured below, back row left to right, front row left to right): Elias Klocker/Florian Koch/Carsten Linden, Michael Bonde/Thomas Enevoldsen/Andreas Petersen, and Iñigo Vallejo Pascual/Miguel Castro/Pedro Lechado Artigues. Oh, and the decks these people had chosen—none of them picked the same for any of the three formats! Several different Processions in Standard, Flickerwisp in Modern, and Watery Grave/Overgrown Tomb/Steam Vents in Legacy were just some of the sweet features represented here. In Standard, the decks were Blue-Black Control, Blue-Black Midrange, and Abzan Tokens. In Modern, Mono-Green Tron, Titan Shift, and Mono-White Hatebears were the weapons of choice. And Legacy featured Grixis Delver, Death's Shadow, and the four-colored goodstuff deck commonly known as "Czech Pile."